As we approach the 2019 Cup Finals basketballscotland are delighted to announce that we will be adopting a new approach regarding the Cup MVP’s for 2019. Each Molten MVP during the 2019 Cup finals will get the opportunity to not only walk away with a Molten MVP Golden basketball but also be offered the opportunity to donate Molten basketballs to a Primary school or a community Youth basketball programme of their choice. basketballscotland understand that many of the players competing in the SBC Finals only received the opportunity to excel in the sport due to the tireless work done at grass roots level and in particular offering players the opportunity to take the first steps on their basketball journey. We hope that by allowing the players to give back to their local communities and programmes that we are going someway to supporting the next generation of keen basketball talent. 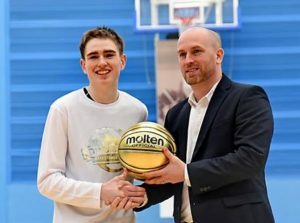 The Molten Golden ball is a great way to recognise the Player’s outstanding performance and this in turn gives them an opportunity to support a Programme which is close to their heart or has supported their development as a young baller just starting out. If we are able to make basketball more accessible to less fortunate communities and support children having the opportunity to play basketball by providing them with Molten basketballs it can only support the growth of the sport at Grassroots level.